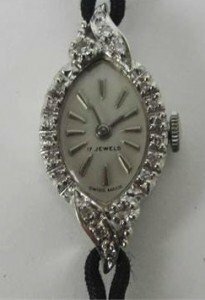 An Art Deco 14ct white gold cased manual wind lady’s wristwatch of elliptical shape, the dial set with baton numerals within a diamond set boarder, on nylon bracelet. 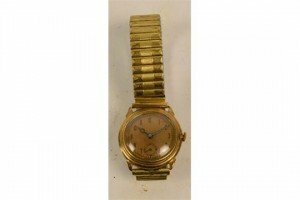 A gold cased manual wind gentleman’s wristwatch, the circular dial set with Arabic numerals and with subsidiary seconds, on gold plated expandable bracelet. 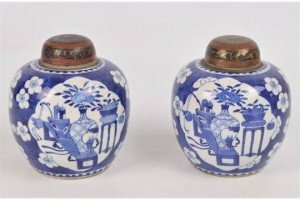 A pair of early 20th century Chinese ginger jars painted in underglaze blue with two opposing panels depicting various items, on blossoming prunus ground, with associated brass covers with incised coloured decoration, bearing a double ring Kangxi mark to bases. A large Japanese Meiji period carved ivory okimono depicting a fisherman with a basket of fish and a cormorant to his side, with inked eyes, with etched character mark signature to the base. A Japanese Meiji period carved ivory figure of a lady holding peonies, height 18cm including rectangular hardwood base on four supports. 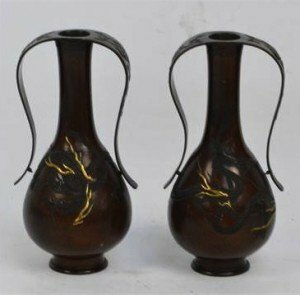 A pair of Japanese Meiji period bronze vases of baluster form with sweeping handles, decorated with dragons. Four Japanese Imari decorated chargers, painted in underglaze blue and overglaze enamels, one depicting a dragon chasing the Pearl of Wisdom to the centre within a border of four panels depicting phoenix and floral motifs, with impressed four character seal mark. 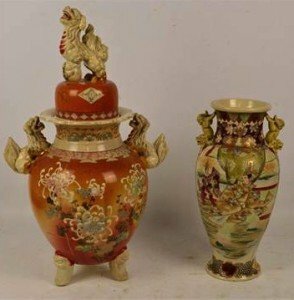 A large decorative Japanese Satsuma vase decorated with chrysanthemums on an orange ground, with Dog of Fo twin handles and a cover with Dog of Fo finial, raised on three mask feet, and a large Japanese Satsuma baluster vase decorated with figures and with animal twin handles. A Japanese Meiji period Satsuma vase of bulbous form with slender neck and flared rim, painted with architectural landscape and floral motifs on blue ground. 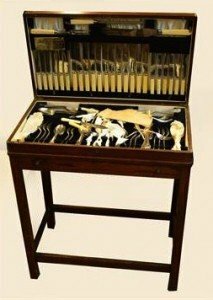 A 1940s oak table canteen of electroplated cutlery comprising dinner forks, dessert forks, soup forks, dessert spoons, ivorine handled dinner and dessert knives, matching carving tools, above a single cutlery drawer. An Edwardian hallmarked silver three piece bachelors tea service of globular form with part gadrooned body. 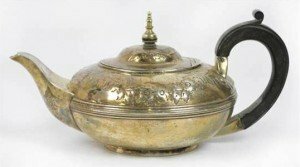 A George IV hallmarked silver teapot of squat circular form embossed with floral swags, with ebonised handle, Rebecca Emes and Edward Barnard. 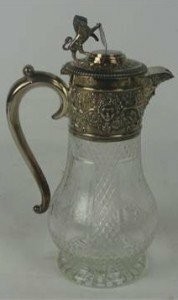 A good Edward VII hallmarked silver mounted etched cut glass claret jug, the hinged lid surmounted with a lion and shield, the spout formed as Bacchus and with overall vine leaf decoration. 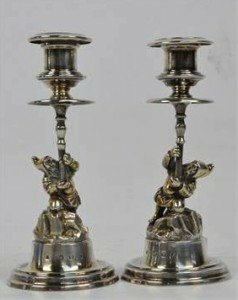 An opposing pair of Elizabeth II hallmarked silver figural candlesticks depicting gnomes on rocks supporting sconces on knopped stems, raised on stepped circular bases. 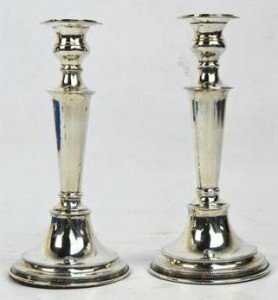 A pair of Elizabeth II hallmarked silver candlesticks with bell shaped sconces above tapering stems to spreading circular loaded bases. 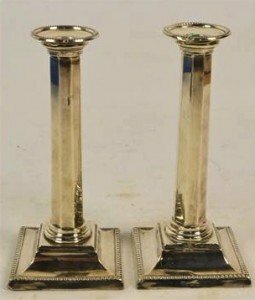 A pair of George V hallmarked silver loaded candlesticks, each detachable circular sconce above octagonal column to stepped square section base. 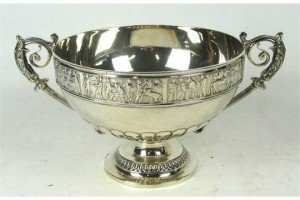 A good and large Victorian twin handled pedestal bowl with pierced scrolling loop handles and detailed band depicting numerous figures in Roman dresses with lobed surbase and stepped circular foot. 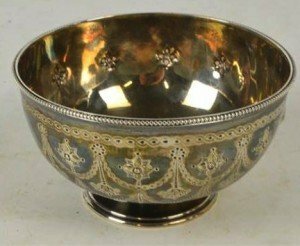 A Victorian hallmarked silver circular footed bowl embossed with floral motifs and swags, and with bead decorated rim. An Elizabeth II hallmarked silver twin handled tray of rounded rectangular form with cast decorated rim and foliate motifs. 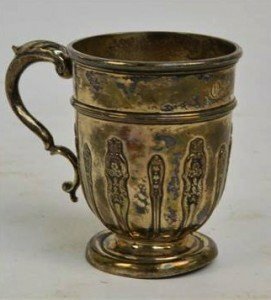 A George V hallmarked silver christening cup with scrolling loop handle, engraved initials and vertical applied bands of decoration above a spreading circular foot.